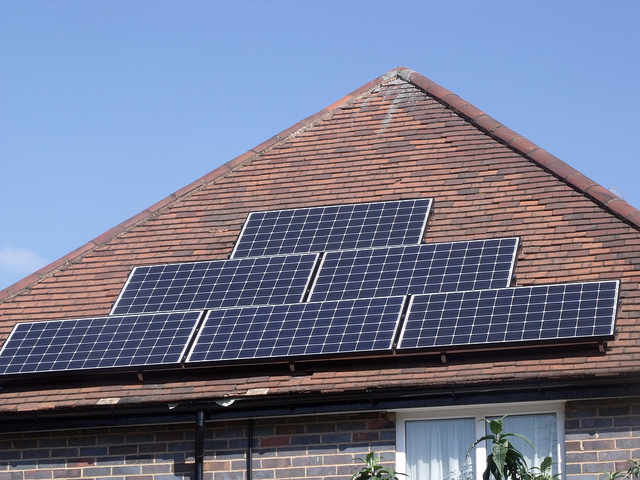 There are no solar panel grants available at a national level in the UK but there are schemes that provide generous funding for people to buy and install solar panels on their homes. The main, nationwide schemes are discussed here. However, there may also be initiatives in your local area run by sustainability groups, community associations or by your local authority. So, as well as the information available here, we recommend you speak to your local council to check if there is additional help available in your area. The main scheme for UK householders right now is the Feed in Tariff (FIT), which is available in England, Scotland and Wales. This is not exactly a solar panel grant but it is a generous scheme that will typically fund the total cost of your solar panel installation and then some. The Feed in Tariff scheme does not provide money up front for the equipment or installation of your panels, but it does pay you an income for the energy you produce and will more than pay for the cost of your solar panels. The Feed in Tariff rewards those who have solar panels installed on their homes by paying 3.86p for every kWh of energy your system produces. This means you are saving twice: you are using less grid produced energy therefore have lower energy bills, plus you are earning a fixed rate for every bit of energy your investment is producing, even the electricity you use in your own home. In addition, you get paid extra for any surplus energy that you send back to the grid at a rate of 5.24p/kWh. Feed in Tariff rates for solar are reducing over time, but the rate you get at the time of installation is the rate you are locked in at. This is fixed for 20 years and index linked. It should see you pay back the cost of your solar panels and make significant profit over the 20 years of the scheme. Read more about the Feed in Tariff in our online guide. Under the Green Deal scheme, householders in England, Scotland and Wales can apply for a loan to cover the cost of installing certain qualifying renewable technologies. Solar panels is one such technology, and therefore as long as you can meet the requirements of the Green Deal, you could be eligible to apply for a loan. To be eligible, you will need to pass certain criteria in regards to your home. This is mainly to do with the level of insulation you have. If you are not up to standard at the moment, you can have this improved under the same Green Deal loan. You have to have a ‘Green Deal Assessment’, which you will pay for and can cost up to £150 and you have to work with a Green Deal provider to get your panels designed and installed. The Green Deal can be a good way of getting the benefits of a renewable energy system now for those who can’t otherwise afford it. However, if you can raise the capital or if you can secure a low interest personal loan from your bank, it may work out cheaper in the long run. The Green Deal is not a grant scheme but a loan. The key element of the Green Deal is that it is designed to be paid back from savings to your energy bills. The loan is designed to pay for works which will pay for themselves over the course of the loan, thereby removing the need for householders to take on the upfront costs. Solar panels will not pay for themselves completely over the period of the Green Deal loan (without counting the payments available from the Feed in Tariff). As a result, only partial funding for the system is possible under the Green Deal. Find out more by reading Solar PV, FIT and the Green Deal. Read more about the Green Deal. Neither the Feed in Tariff scheme nor the Green Deal are currently available in Northern Ireland. The funding mechanism for solar panels in Northern Ireland is the Northern Ireland Renewables Obligation (NIRO). Like FIT, NIRO is not an upfront grant but rather a scheme which pays you for the electricity that you produce. There are differences in the schemes. Find out more about the Northern Ireland Renewables Obligation. This entry was posted in Feed in Tariffs, Grants / Funding, Green Deal, Solar. Bookmark the permalink.